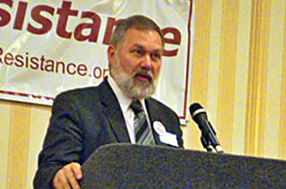 Scott Lively, one of the most heinous anti-gay hate group leaders and extremist preachers in America who is currently being sued for crimes against humanity by Sexual Minorities of Uganda, over Lively’s incitement of the murder of homosexuals in their nation is thinking about running for Governor of Massachusetts. Pastor Scott Lively of Springfield today announced the formation of a committee to explore the possibility of a run for the governorship of Massachusetts. A fifth generation Bay Stater, born and raised in the Village of Shelburne Falls, Pastor Lively was for many years a Christian missionary and social activist in various parts of the world, based primarily in Oregon and California. In 2008, following a year-long speaking tour through eight countries of the former Soviet Union, he and his wife Anne moved back to Massachusetts to start a mission to the poor and disadvantaged in inner-city Springfield. They bought a home in the heart of the troubled McNight neighborhood and opened a church and ministry center called Holy Grounds Coffee House, strategically located on State Street between the Downtown and Mason Square areas, to serve the homeless and street populations of the city. …Pastor Lively is an internationally recognized authority on biblical values in public policy, serving as an educator, trainer and consultant to church, community and government leaders in more than 30 countries, and as a media figure in more than 700 radio and television interviews here at home. He is known as the “Father of the Ugandan Homosexual Movement” for his work in that country, and his efforts in Russia, Eastern Europe and the Baltics have strengthened both the Christian church and social resistance to the homosexualization of those regions.